I am Kalam: To Kalam, with love | MADRAS INK. If someone were to take the most inspiring ideas from the books of APJ Abdul Kalam and made a movie to show its applications in contemporary India, it would be a lot like Nila Madhab Panda’s I am Kalam, a hit at festivals around the world. The film was rated 4.40 on 5 by audiences at the Transilvania International Film Festival recently. 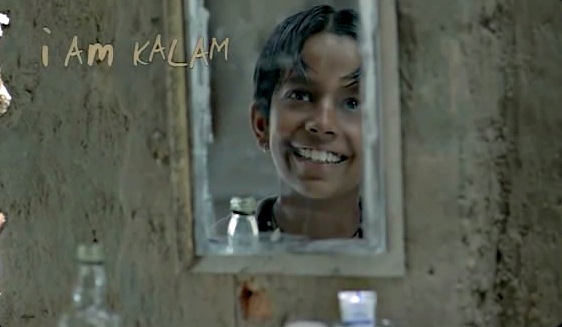 Street smart Chottu (Harsh Mayar), who works in a Rajasthani dhaba that caters to the haveli-turned-hotel, catches Kalam’s address on TV and becomes an ignited mind. He already had a passion for books and education and dreamt of becoming one of those television models sporting ties on TV. But now, he finds a role model in the President and gives himself a name. Kalam. Little Kalam does not lie. He does not steal. He stands up for friends. He works hard and wants to earn to fund his own education. He’s a great example for kids. And this is one reason you must take your kids to watch this film. When Kalam catches the President’s four-step path to success (Dreams. Action Plan. Hard Work. Courage), he transforms into a student. So what if he’s not in school. The game changers in Kalam’s life happen through the friendless young rich Rajput prince (Hussan Saad) and a foreign tourist Lucy who share their knowledge with him. While the Prince teaches him English, the tourist teaches him French and the young lad himself teaches them everything he knows – from Hindi to Camel riding to lesser known aspects about India. The village in Rajasthan becomes a microcosm for what India represents today with one feet firmly in the past and one in the present. The haveli may open itself up to tourists but is still unwilling to go all out and start cooking in the palace to cater to them. Kalam becomes a knowledge centre in months and shows great promise of becoming a leader. The filmmaker wants to ensure that we don’t dismiss this off as idealism and shows us change in Kalam, slowly and steadily. He learns simple things that any of us can in a matter of minutes – whether it’s about making tea, or wearing a tie, to basic greetings in different languages. And he connects everything he learns from people with what he reads in books. There’s a beautiful scene in the middle of the film when a whole group joins in an impromptu jamming session led by Chottu. There’s a guitarist, there are folk artistes and there’s a foreigner playing an Indian string instrument. Thankfully, the change in Kalam does not happen because of the foreigner. It happens because of children. They overcome their obstacles and speak up for what they want by initiating a dialogue with the older generation. Kalam does not care about winning himself. He is confident. He knows he will reach his destination some day. And wants his best friend to win, whether it is a French test or a Hindi elocution contest in school. While many Indian youth (like Pitobash as Luvtund) grow up idolising film stars, we are really lucky to have Kalam. And it’s a good thing that someone made a film to give kids a role model, someone they can become.